Tag Archives for " Dream "
My phone buzzed. The text was from my mother—impressive in itself as she celebrated her 70th birthday more than three years ago. Mother: I’m getting a piano! I shouldn’t have been surprised. My mother has dreamed of playing the piano as long as I can remember. As children, my sister and I took piano lessons for years (my sister plays still; I have other gifts). We even had a piano in our home. It was no cheapo either: piano tuners still rave about the quality of it. I can’t imagine what my parents sacrificed to pay for that piano and for our lessons. Daddy was a Baptist pastor and mother, a stay-at-home mom; we had enough, but seldom any extra. Mother loved that we took piano, even though (or maybe especially because) she never had. She could play a little, even read music in her own way. We’re not sure how she did it, because she didn’t know the names of the notes or even where they were supposed to be on the keyboard. No matter, she’d open her Broadman Hymnal, study the page, then manage a pretty good version of the song before her. Who knows? She still has that Broadman Hymnal, but I have her piano in my house now. My oldest daughter began taking piano eight years ago; Mother couldn’t wait for her granddaughter to play on her beautiful piano (it had stood silent for so long). It’s not silent now. Both my older children take piano and they actually practice. Turns out that helps you get better. Wish I’d known that. I called Mother after getting her text. See, my mother, well into her seventh decade, has never given up on her dream to play the piano. 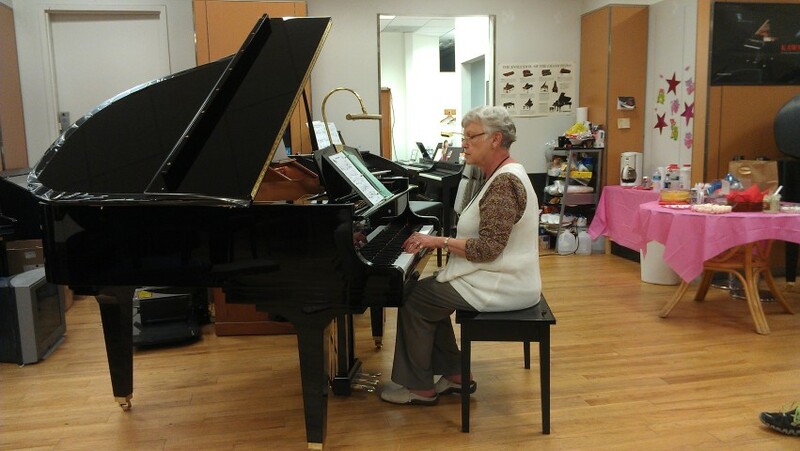 So when she was walking through the mall last summer and saw that the piano store was offering group lessons for adults, she marched herself right in there and signed up. She finished the first round of lessons, played in her first recital, and was all set to sign up for the next class when she decided she would go all in. She talked to the teacher, worked out private lessons, and then set about picking out her piano.